He works alone. "It must be nice for you, not to need anyone," his handler tells him, and he doesn't respond. The job is to go into the wilds of Tasmania to procure "biological samples" from the Tasmanian tiger--the last one, if it even exists. No one's photographed one in decades, though one has apparently been sighted, barely. He goes to his rented room in a home near the wilds, and gets to work. 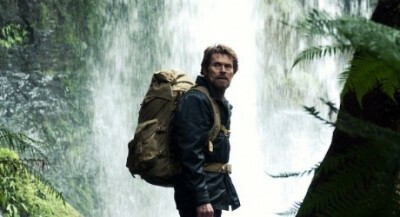 His name is Martin David, and he's played by Willem Dafoe in Daniel Nettheim's challenging, difficult, and haunting film The Hunter. The broad strokes of the story are less than revelatory--the moment the camera lands on the precocious kids and lovely widow he's renting the room from, it's fairly safe to assume that the emotions and personal stuff he keeps stifled will come out for a look around--but the film is smooth and tightly crafted. It's a character study, for the most part, allowing the complications and relationships to puncture the narrative only when they have finally penetrated the man. Much of the story, particularly its early passages, are simply Martin out in the woods, trapping, waiting, occasionally firing his rifle. (The gunshots are piercingly loud and scary; the sound design is superb). Nettheim lets him work in the silence he would dwell in--this, thankfully, is not one of those movies where the protagonist mysteriously and awkwardly talks to himself all the time. This stranger is not exactly welcomed in this strange land. In fact, he finds himself in the unfortunate position of being everyone's enemy; the local loggers assume he's a scientist trying to save the forest with the "greenies," who are in turn suspicious of his hunting (especially his steel traps). Slowly, he develops a rapport with Lucy Armstrong (Frances O'Connor), whose husband went missing in the very wilds he's in, and her children. Because the story is told so squarely from Martin's POV, Alice Addison's screenplay is occasionally muddled, though she and director Nettheim often create tension even when we're not entirely certain of what's happening. (There is also a lingering question of why on earth Martin returns to the bar that he was razzed out of early on; the scene ultimately serves as the too-transparent introduction of a new character that could easily have surfaced the first time around.) We invest our trust in Dafoe, an actor easily taken for granted, but peerless in projecting the image of this kind of no-nonsense character. O'Conner (who was on the verge of exploding, it seemed, back in the early years of the last decade, and has been missed) compliments him well, and Sam Neill's presence as a salt-of-the-earth type is mighty reassuring. Despite the title and subject matter, The Hunter is a modest film, contemplative even, though the action--when it comes--is taut and bracing. There is a strange beauty and quiet majesty in its closing scenes, which are powerful and, in a specific and horrible moment, genuinely upsetting. This viewer struggled with the path the film--and the character--takes; these are complicated emotions that are tough to have stirred up. It's a film that stays with you long after the fade-out, and that's a rare and commendable phenomenon. Buy tickets to "The Hunter" now!